Published: Sept. 17, 2016 at 10:46 a.m. Updated: Sept. 18, 2016 at 12:54 a.m.
Editor's note: In this space we'll track the top 10 players in college football (based on NFL.com analyst Chad Reuter's rankings) through the third weekend of the season. Here you'll find each player's final stats and analysis of their performances from Reuter. The post will be updated throughout the day as games conclude. All times listed are Eastern. Reuter's analysis: While he wasn't dominant in his matchup against Auburn left tackle Austin Golson, Garrett played like the gifted all-around player that he is. Auburn rarely ran to his side of the field when he was in the game. He played the run well, though, holding the edge and shedding blocks and finding the ball inside or outside. Garrett was credited with two sacks on his three tackles for the evening, ripping down Auburn quarterbacks as they tried to move outside the pocket. Week 3 stats: 28 carries for 147 yards (5.3 average), 2 TDs. 4 catches for 27 yards (6.8 average). 2 fumbles (lost one). Reuter's analysis: After a week off, Fournette returned to form against Mississippi State -- for the most part. He announced his good health, unloading a stiff-arm on his first run that put his would-be tackler to the ground. He ran strong behind his pads to keep the ball moving forward through tackles, especially around the goal line. NFL scouts were happy to see how dangerous he can be on a screen pass, running through arm tackles and setting up defenders for cuts. And he actually threw a nice spiral on a fake reverse, although the pass fell incomplete. Fournette did lose the ball a couple of times in the second half while trying to get an extra yard in traffic, which helped the Bulldogs get back into the game. Week 3 stats: 12-of-15 for 152 yards, 3 TDs. Reuter's analysis: The Tigers needed an easier contest after tough wins over Auburn and Troy, and they got it. Watson didn't even have to play a full half against the Gamecocks. He didn't need to rely on his feet today, as he was able to hit targets from the pocket at will. Scouts will be glad to see him convert touch throws and slants against a defense from a lower level of competition. Week 3 stats: 30 carries for 165 yards (5.5 average), TD. 4 catches for 73 yards (18.3 average), TD. 1 kickoff return for 22 yards. Reuter's analysis: Once again, McCaffrey led the way for Stanford on offense and special teams as a hostile host of USC, accumulating 260 yards of total offense. He carried the mail 30 times for the Cardinal as the team ran the clock with a large lead for three quarters of the game. He ran through creases wherever his offensive line created them. The most surprising play of the night was when USC left him wide open on a wheel route out of the backfield, resulting in a 56-yard touchdown. Watching him run routes like a receiver is remarkable, although given his father's acumen, it's not that much of a surprise. Stanford used him as a decoy a couple of times, sending him outside so that room opened up between the tackles. Week 3 stats: 20-of-37 for 344 yards (9.3 average), 2 TD, 1 INT. 9 carries for 14 yards (1.6 average), 2 TDs. Reuter's analysis: It was a mixed bag for Kizer against Michigan State. His athleticism and arm strength were on display throughout the contest. He looked like a veteran when he called an audible on a couple of occasions in the first half, and sold an outside option hard before passing over the approaching corner for a big gain. Kizer went through a dry spell in the middle of the game, putting passes outside the reach of his receiver and rushing his throws when he saw pressure coming. His inexperience also showed when linebacker Jon Reschke bated him into throwing an interception. Kizer got his feet underneath him later on, standing tall in the pocket and throwing multiple touchdowns to get his team back into the game late. The Irish came up short, and this was a learning experience for the talented redshirt sophomore. Week 3 stats: 13-of-20 for 216 yards (10.8 average), 1 TD, 1 INT. 17 carries for 146 yards (8.6 average), 4 TDs. Reuter's analysis: Jackson's explosive running skills were on display throughout the team's big win over Florida State. His pure speed and elusiveness in the open field, along with more strength than you'd expect given his lean frame, make him extremely difficult to bring down. As a passer, Jackson showed off a rocket arm but wasn't as accurate as he has been. He displayed a lack of touch when overthrowing some open receivers and threw too far inside on other plays (including a poor decision that led to an interception in the end zone.) Regardless, his all-around play cemented his place as a top Heisman contender. Week 3 stats: 4 tackles, 1 INT (returned 75 yards for TD), 1 QB hurry. Reuter's analysis: It's not often a 290-pounder goes 75 yards for a pick-six, but Allen managed the feat on Saturday. Ole Miss QB Chad Kelly was hit while trying to throw, Allen corralled the errant pass in his belly and ran the distance. Allen's quickness as a pass rusher was clear when he lined up inside against Ole Miss' interior linemen. He got a sack in the third quarter when slanting inside, crossing the face of his man to get into the backfield and swallow up Kelly. Allen held up well outside, as well, forcing plays to the linebackers and providing pressure at times. Allen also caused a goal-line false start with a quick shift before the snap. Week 3 stats: 16 carries for 54 yards (3.4 average). 1 catch for 8 yards. Reuter's analysis: Louisville's defense did not allow Cook to get going today -- and neither did the Cardinals' offense, which put FSU's running game on the shelf by rolling up touchdowns. On stretch plays outside, there were no holes for Cook to explode through. On one zone left carry, he cut back nicely, only to find Louisville safety Josh Harvey-Clemons waiting for him. Cook's pass-protection attempts were very poor throughout the day, as he dropped his head and whiffed on multiple occasions. NFL coaches won't like seeing that -- a three-down back must be able to hold his weight as a blocker. Week 3 stats: 1 tackles, 1 pass breakup. Reuter's analysis: North Texas stayed away from Tabor for most of the night -- smartly, I might add. He was rarely tested, as the Mean Green couldn't get anything going against the Gators in a 32-0 loss. Tabor was called for pass interference twice, although one was a questionable call. There was nothing for scouts to be worried about on those calls. In fact, that willingness to battle on every play, even when there isn't much action coming his way, will be applauded. Week 3 stats: 5 tackles, 2 pass breakups. Reuter's analysis: It was not a great day for Humphrey. He gave up a couple of big plays to star receiver Damore'ea Stringfellow. The receiver got inside and elevated over Humphrey to high-point a jump ball in the first half. Humphrey fought through the play, but lost the battle because he wasn't in position. Later, Stringfellow stopped Humphrey on a double-move and made a nice catch between the corner and safety Eddie Jackson. Finally, the redshirt sophomore corner fell down in the end zone so freshman A.J. Brown could catch a touchdown that put the final result in doubt. He'll need to have a short memory after this game. Week 3 stats: 9 tackles (3.5 for loss, including 1 sack), 1 QB hurry. 4 punt returns for 99 yards, TD. 2 kickoff returns for 81 yards. 2 rushes for 24 yards. Reuter's analysis: The Wolverines needed their defensive leader to step up when Colorado challenged them. He did just that, playing behind the line of scrimmage a lot of the day to stop runs and attack the quarterback on blitzes. Peppers made a huge third-down stop in the first half, shedding a block and stopping the back. In the second half, his return abilities shined, setting up his offense for a touchdown drive with a 55-yard kickoff return early on, then taking a punt 54 yards to the house in the fourth quarter with instant acceleration, north-south running, and strong cuts on the run. That's the sort of all-around effort NFL scouts expect from an elite prospect. Week 3 stats: 6 tackles (one for loss), 1 INT. 1 punt return for 25 yards. Reuter's analysis: USC's struggles continued at The Farm on Saturday night, but don't blame that on Jackson. 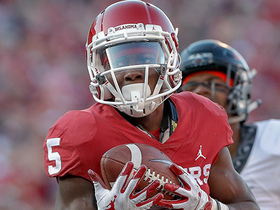 Stanford threw his direction one too many times in the second half, and Jackson made them pay with a high-point interception where he was perfectly in phase with the receiver. Unfortunately, the Trojans couldn't capitalize on it. Earlier in his game, Jackson proved himself a physical tackler who wasn't afraid to come into the box to ride All-American Christian McCaffrey to the ground. A 25-yard punt return also reminded everyone of his elusiveness with the ball in his hands. Reuter's analysis: Although the Irish didn't look great on offense, McGlinchey did his job on most plays. He showed scouts very good footwork as a run blocker, moving downfield to hit his targets and just off the edge to seal his defender. He displayed excellent strength by carrying his man and running back Josh Adams into the end zone in the fourth quarter. McGlinchey got a wake-up call earlier in the game from Spartans defensive lineman Malik McDowell when he failed to keep his feet moving after initial contact, allowing McDowell to win the edge. Reuter's analysis: When Robinson locks onto a defensive end, that dude can forget it. Even talented guys like Ole Miss end/linebacker Marquis Haynes aren't getting free once those huge hands are engaged. His power was on display, as well, when he turned his man on running plays and in goal-line situations. The Rebels' defense caused him fits at times, however; he was penalized for false starts and got into trouble in pass protection when lunging instead of staying in balance. When his team needed him, though, he was a rock.